Now What? : Tea Parties, Cooking and Cleaning. In addition to the shoe hunt, I'm also hunting for play foods for TG. She's at this stage now where every cooking session has some participation on her part. Today, I gave her the analog food scale and some potatoes and she had a jolly time weighing the potatoes while I made some fish and pasta. It's Ash Wednesday. By the way, Chinese New Years and Lent don't mix. I packed this huge yummy lunch of leftover New Years eats only to be reminded today was a day of fasting and abstinence. Lunch today was mac and cheese but tomorrow I feast! Her to broom, mop, duster and dust pan came in today and she's also been helping me clean up. Man of man do I hope this stage of helpfulness stays around for a long time. I'm loving it. 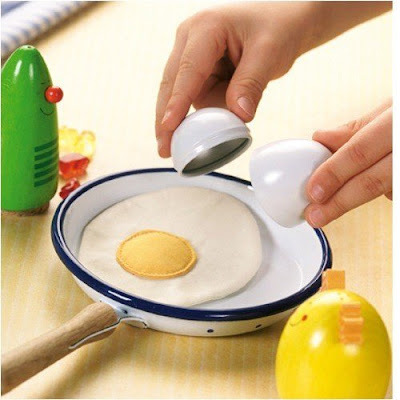 Since she loves helping me make eggs in the morning, I thought it would be neat to buy some play eggs. Did you know that most wooden play eggs don't crack? Yup. I finally found one from Haba. It's a tin egg with a fried egg in it. I hope it is entertaining for her. I also picked up some wooden cut veggies and fruits so she can 'cut' her veggies while I make our meals. I figure I'm going to research doll houses for her 2nd birthday. I think that's something she'll like. She's started doing all the typical girl stuff you read about. Today she had me put her stuffed animals on chairs and she fed them peanut butter play dough and pretend tea. She also had them each do something unique. Her penguin played with her toy guitar. Her knight with horse sat with her play dough. Her pirate sat by her xylophone. I'm seeing some leadership skills growing. It's like when she feeds her playmates and brings them water. She's like a little mommy making sure folks are fed. Oh here is another milestone. 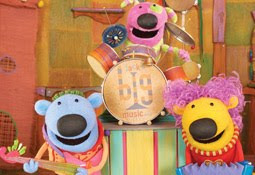 She knows the main characters on Jack's Big Music Show now. We play JBMS on several occasions, when DH has to use the restroom and there is no one around, when she has a particularly messy poop diaper and we need her not to squirm and in an embarrassing admission when DH and I need a little private time. Trust me this is not as often as you'd think or I'd like but you do what you gotta do. It's about the only program she is allowed to watch. She had a poop diaper and came to me and said, "Poop. Jack. Mary. Mel."